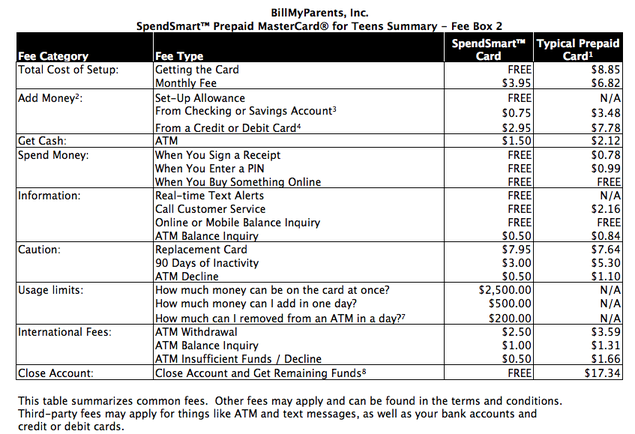 BillMyParents SpendSmart MasterCard: Good for Your Teen? A little known company called BillMyParents is about to become a household name thanks to a recent endorsement by pop sensation Justin Bieber. The product Bieber will be pitching is the “SpendSmart MasterCard,” a prepaid card parents can give to their teens as an alternative to cash. Hopefully it will fare better than the short-lived Kardashian credit card, which fell flat after it was discovered to be riddled with fees. The BMP SpendSmart MasterCard works like most other prepaid cards in that it doesn’t require a credit check, and can be loaded with cash from a variety of sources. But is also comes with a lot of pretty neat features that separate it from the crowd. One nifty feature is the ability to track your teen’s spending. 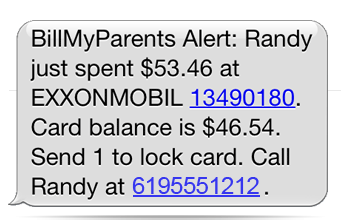 So any time it’s used, the SpendSmart MasterCard will send the parent a text message detailing the transaction. It includes when it happened, where it happened, and how much was spent. It also gives you the updated account balance after said purchase. Additionally, it gives you the option to lock the card simply by responding to the text message. So if Jonny isn’t being responsible, you can cut him off within seconds. All you have to do is text a “1” to block the card, or a “2” to unlock it. The SpendSmart MasterCard also blocks spending at known “bad places,” whatever those may be. I’m assuming liquor stores and other places teens shouldn’t be, though places like a 7-11 could be deemed a gray area? While it all seems to be about hindering teen spending, you also have the ability to add emergency funds from just about anywhere if they run out of cash and need it desperately ($2.95 fee applies). In other words, it’s more about managing your teen’s expenses than it is about limiting them. One of the major downsides of prepaid cards is the fees, including the $3.95 monthly usage fee that comes with this puppy. The American Express Bluebird prepaid card recently did away with most fees, but it’s kind of in a league of its own at the moment. The SpendSmart MasterCard offers a number of loading options, though only one is free of charge. 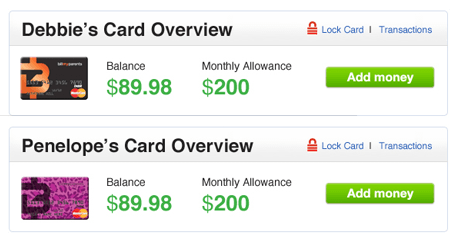 If you set up recurring “ACH Monthly Allowance Loads,” you can add money to the card for free. Otherwise you’re looking at a $0.75 charge for loads via checking/savings accounts and a $2.95 charge for loads from a credit or debit card. The card cannot be loaded by check, money order, or via a retail store. If your teen wants to withdraw cash, they have to pay $1.50 plus whatever the third-party ATM operator charges. So it’s best to just use the SpendSmart MasterCard like a debit/credit card wherever MasterCard is accepted (which is just about everywhere). Which Will Cost You Less? While the SpendSmart MasterCard looks pretty cool, and has some great features to keep a leash on your teen’s spending, it has costs much like other prepaid cards. Aside from the fees listed above, there’s also the $3 inactivity fee to worry about, and the $7.95 fee to replace a lost card. FYI, teens are good at losing things, especially important things. The saving grace is that you can shut off the card immediately if they do misplace it, and reactivate it once it’s found. This would certainly be a lot easier than dealing with a lost or stolen credit card. Another downside is that your teen won’t get any “credit” for carrying the SpendSmart MasterCard, unlike a traditional credit card that builds credit history. 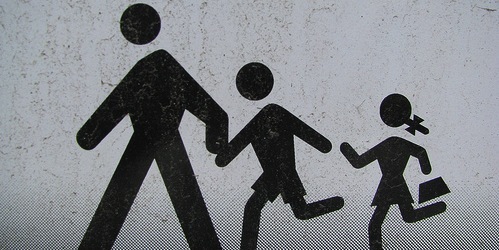 Clearly this can be good or bad – BillMyParents highlights the good side of things, namely the fact that your teen can’t ruin their credit (and yours) in the process. But with all the fees, which could easily top $100 annually, it may be better off to add your teen as an authorized user to an existing credit card and take a chance. Then just monitor their spending the old-fashioned way. This will help them establish a good credit score early on and teach them the value of credit, as opposed to debit, which is really all a prepaid card is. If you are interested, the SpendSmart MasterCard can be used on a free trial basis for 30 days. Read more: Do you need a credit card to build credit? Yikes! Bieber should NOT be a spokesperson for any financial product. He’s completely out of control and a terrible role model for teenagers.